For me, kitchen day is sometimes once, usually twice a week – on Wednesday and Saturday. But your Kitchen Day can move around if you’ve got appointments or other things going on. If you’re new to the blog and unfamiliar with Kitchen Day (or Baking Day as I sometimes call it), be sure to check out my e-course where I share that it’s a part of my homemaking method. In most cases, the part of the meal that takes the longest time to get on the table is the meat or protein. You may have seen before that I cook one or two meatless meals every week, but we still do love meat in this family. But I don’t like the way my house smells after I cook it! Meat smell to me is gross. I’m weird…I know. But I feel like I know y’all well enough I can share my weird things! Bread-baking makes my home smell amazing – warm and inviting. But meat cooking…good heavens, y’all – I hate it! I can’t diffuse enough Citrus Fresh in my house after cooking meat. All I can smell for hours, maybe days, is meat. Plus, it makes my house dirtier – with all the splattering grease and stuff. I realize this might not be a problem everyone has, but for me, the struggle is real. Whenever I have the opportunity, I will find a way to have my house NOT smell like meat. I’m often prepping meats in advance in the crock pot out in Barry’s workshop. And, I also love to cook on the grill in the summer; it’s an excellent way to get tender meats for reheating. 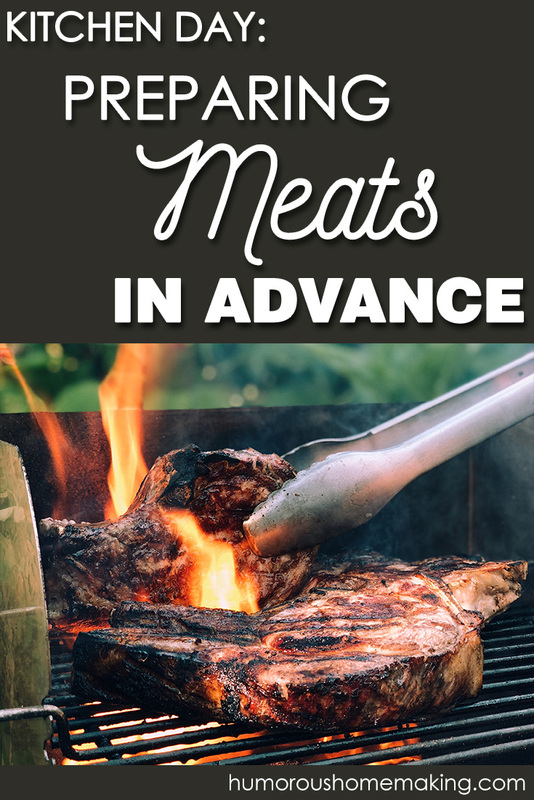 Prepping meats in advance will save you so much time – believe me! All you need to do to reheat your meat quickly for dinner is warm it in a skillet with a little liquid – oil, broth, canned tomatoes, water, etc. – boom, there’s your main dish! I always choose a quick side – usually frozen veggies because they are so quick and don’t go bad! Then all you do is just add some water and steam them in a pan, and then toss with butter and salt. Bam – dinner! Prepping meats in advance just makes sense. Make a large roast in the crock pot or steaks on the grill, and then once it’s cool, portion it out for future meals. But please, if you want your meat to be tender and fresh, you’ve got to reheat low and slow. No zapping in the microwave! Slowly steam it with a little liquid over a medium-low to medium heat. Once it warms all the way through, you can take the lid off. As the liquid evaporates, the meat will begin to crisp and brown up again. Cook cubed steak in beef broth and “everything but the bagel” seasoning (from Trader Joe’s) in the pressure cooker for 8 minutes with natural release. This cut of meat is delicious – and tender enough for me to eat with my braces! My kids like it with ketchup while I love it plain or with a fried egg on top! To reheat, I just add it back to the skillet with a few tablespoons of liquid. You can add sliced onions too. I serve over mashed potatoes or rice. Brown your ground beef ahead of time for taco salad, tacos, and chili. All you have to do is add the seasoned browned beef to a skillet with 2-3 tablespoons of water. Are you noticing a trend here? LOL! Don’t underestimate how much better your reheated meat will taste if you reheat SLOWLY in a covered skillet. It’s such a slow reheat – the meat never dries out with this method! Make bacon in advance…in the OVEN!!! Mostly because I hate the dirty bacon grease mess that you’ve got to clean up afterwards so much, I like to cook 3 pounds of bacon on cookie sheets in the oven all at once. We usually go through 3 pounds a week for our family of six. I reheat however many pieces we need in a skillet at a time. It literally takes 30 seconds to reheat in a hot skillet. You have bacon all week – with the mess once. It’s a life hack that just makes too much sense not to do! Did I tell y’all meats reheat well? 😉 If you just get in the habit of cooking your meat once or twice a week all at once, it can change your life (and the smell of your house). 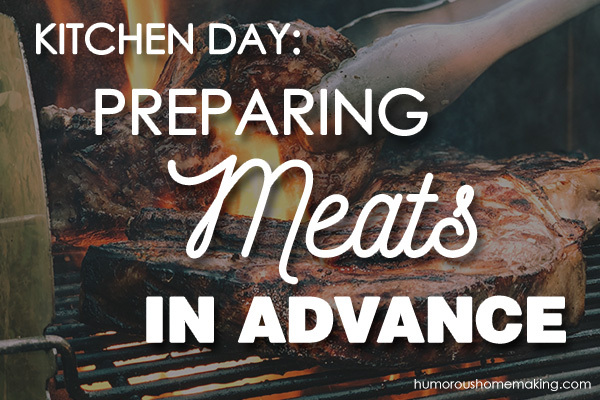 I hope you see that prepping meats in advance is easier than you thought and such a huge time-saver. Oh, and if you come only away with one new thing today let it be this: NEVER reheat in the microwave! Amen and amen. I have been cooking my beef and hamburger before freezing for many years. It saves me so much time on a busy night ! I just put 12 bags of beef tips and for bags of beef broth and 15 bags of cooked hamburger in my freezer tonight. I also place my boneless skinless chicken in a marinade before freezing….it marinades as it defrosts. Thank goodness for my Food Saver! That’s so smart! I wish I had 12 bags of beef tips and 15 bags of cooked hamburger in my freezer right now! What a great help that would be:) Thanks for commenting, Lori Ann! What about chicken? Is it worth doing this for chicken? How long is it good for in the freezer? Yes, you can definitely cook chicken ahead of time and store in the freezer. I usually shred mine before freezing or freeze entire chicken breasts. But keep in mind you may need to add extra liquid to the chicken when reheating because it is a leaner meat and can dry out more easily. Thanks for commenting, Michelle! How do you keep the oven from getting splattered all inside with bacon grease?? I stopped cooking bacon in the oven for that reason. ? I like to start my bacon in a cold oven and then preheat to 375. Something about the cold start helps the bacon splatter much less. Give that a shot and let me know if it helps. Thanks Jeanne! hahaha! I so know what you mean about that meat smell. I had never really thought about it until I was reading a novel once (gosh, almost 25 years ago) that referred to the “putrid smell of cooking meat” and ever since then, I have hated the smell of cooking meat. I have to season it up with lots of fragrant seasonings (like garlic, yum) to cover the smell of the meat. It does help if there is garlic and onion smell – that kind of overpowers the meatiness. But yes, it can be downright PUTRID. Blech. Thanks for the comment, Jennifer!